Born August 11, 1939 in Stockholm, Sweden. As a boy Olof grew up playing both soccer and ice hockey. Due to his size, soccer won out. A highlight of his childhood was accompanying his dad to the International match between Sweden vs. Switzerland and watching his soccer hero, Gunnar Gren. Olof and his family immigrated to the United States in 1949. He remembers going out to watch his father play for the Vikings Soccer Club. Playing soccer occupied much of his time in Junior High and High School. 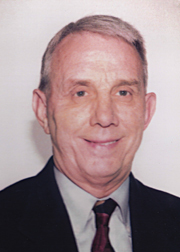 He joined the Rollo Soccer Club from the Association’s First Division in 1957. After returning from his LDS mission in Sweden in 1962, he reunited with his friends at the Rollo Soccer Club. After spending a couple of year with them, he joined the Vikings Soccer Club in 1964. During this time several Championships were won and Olof continued to play for Vikings Soccer Club until 1985 when he retired from competitive soccer. Since his retirement in 1985 he has continued his love for the game by successfully coaching youth soccer teams in both the UYSA and AYSO organizations.